It has just been announced that Jason Donovan is to star in the tour of Million Dollar Quartet which kicks off at the Leicester Curve in September. Jason Donovan is playing legendary record producer Sam Phillips - the man who brought the four recording stars together to create music history. Jason's musical theatre credits include leading roles in The Rocky Horror Show, Chitty Chitty Bang Bang, Sweeney Todd and most recently, Priscilla Queen of the Desert. Joining Donovan in the cast is Martin Kaye as Jerry Lee Lewis. He played the role on the first North American tour of of the show and the Las Vegas Production. 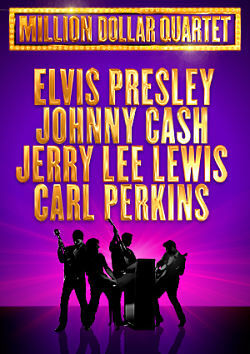 Robbie Durham plays Johnny Cash Ross, William Wild is cast as Elvis Presley, Matt Wycliffe appears as Carl Perkins and Katie Ray is Dyanne.